Very few performers can sing vocally demanding, dramatic solos while a movie camera inspects their nostrils. So given that I’ve never seen a stage production of Les Misérables and probably wouldn’t enjoy it if I did, am I still allowed to say that this show could surely have been done better justice than this movie does it? Displacing epic action and huge musical numbers from the stage to the screen would present a tricky problem for any director, but Hooper (whose last film was the small-scaled, Oscar-winning The King’s Speech) makes such jarringly discordant choices it’s hard to figure out what he’s even trying to do. 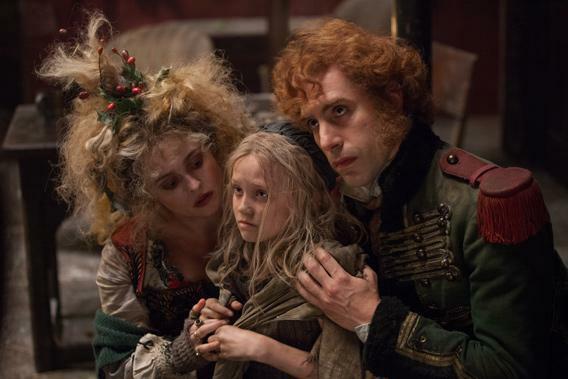 I don’t know when I’ve seen a movie with a stranger sense of visual scale than Les Misérables. Though many scenes take place in spectacular (often digitally augmented) locations—the halls of cathedrals, the hulls of huge ships, the barricades of 19th-century Paris—the viewer’s experience is always that of being trapped in a small room with someone singing 6 inches from your face. Hooper is in love with the low-angle close-up; his camera follows his actors around like a cocker spaniel, peering up adoringly at them and frequently launching itself in their faces. In especially heightened dramatic moments—the kind this musical strings together in a fairly unbroken crescendo—he’ll abruptly and inexplicably tilt the camera at a German Expressionist-style 45-degree angle. There are very few performers who can pull off the trick of singing vocally demanding, hyperdramatic solos while a movie camera inspects their nostrils. Hugh Jackman, as escaped-bread-thief-turned-upstanding-citizen Jean Valjean, is among those few. A longtime stage veteran who also knows his way around a movie set, he somehow calibrates his delivery so it’s just the right size for the awkward container Hooper has put him in. The songs may still sound tuneless and bombastic to my ears, but Jackman can not only sell this kind of material, he can sell it for twice its value. Thanks to his performance, I was able to overlook the sluggish libretto long enough to tear up over Valjean’s plight. Hooper’s decision to record the actors’ singing live on set (rather than having them lip-sync over their own prerecorded voices, as is the practice with most filmed musicals) lends some of the big singing scenes an unintended frisson of suspense, as the audience wonders “Oh God, is she going to be able to hit that note?” Most of the cast—Jackman and Barks are among the exceptions—aren’t professional singers, but that in itself doesn’t necessarily constitute a problem. I can be a fan of the karaoke-style Hollywood musical that allows for differing degrees of vocal talent (Mamma Mia!, Rock of Ages). Amanda Seyfried, who sang ABBA songs perfectly prettily in Mamma Mia!, is way out of her range as the soprano ingénue Cosette—she ends one love duet on an alarming octave-jumping squeal. Russell Crowe has been taking a lot of heat for his less-than-exceptional singing in Les Misérables, but when he’s not asked to do anything too pyrotechnic, Crowe (who’s fronted a few of his own bands in Australia) can carry a tune nicely enough. A duet in which he and Jackman sing interweaving melody lines while dueling with a sword and a piece of wood does point up Crowe’s vocal shortcomings, but the bigger problem is his apparent discomfort in the role. He just seems stiff and awkward singing awful rhymed couplets in close-up; an understandable reaction, given how unpleasant the experience is on our side of the camera as well. Helena Bonham Carter and Sacha Baron Cohen appear intermittently as a pair of comic-relief innkeepers; their broad, lecherous slapstick is a refreshing break from the somberly upstanding proceedings, until they, too, begin to grate on our nerves. Les Misérables is a long, windy, thematically repetitive musical; if you didn’t understand a plot point or get to hear quite enough of a favorite song, just sit tight and it’ll come back soon. In the “I Dreamed a Dream” scene—the standalone set piece that will no doubt become the movie’s Oscar audition tape—Les Misérables tries—with mixed success, but God, does it try—to fuse raw emotional immediacy with the mechanics of virtuoso ballad-belting. Hathaway’s big song, delivered in extreme close-up in a single, very long take, is deeply felt and impeccably delivered (at least up until the last verse, when her voice constricts with emotion, trapping the sound in her throat). But Hooper’s relentless, static framing of this already maudlin number (a penniless prostitute’s swan song to an unfeeling world) gives the scene a gimmicky, showoffy quality that, for me, obscured its drama. As the camera reverently gazed through the alabaster pillars of Hathaway’s teeth, all I could think about was the proximity of her tunefully vibrating larynx. She nails the song, no doubt about it, but it’s a performance that, to me, is too much about the awesomeness of its own nailing. (And it doesn’t help that Hooper’s camera won’t stop asking is she nailing this or what?) We’re all familiar with the experience of seeing movies that cram ideas and themes down our throats. Les Misérables may represent the first movie to do so while also cramming us down the throats of its actors.